Patrick Kane, David Kampf and Nick Schmaltz scored for the Blackhawks after they fell behind 4-0 in a quiet United Center, but the team’s comeback came up just short. Colliton, who was promoted from Chicago’s American Hockey League affiliate in Rockford, Illinois, is the NHL’s youngest head coach at 33. Chicago’s Corey Crawford blocked 30 shots as he faced ample tough chances set up by breakdowns in front of him. Svechnikov opened the scoring 4:46 in, cutting across the crease and using a long reach to tuck in rebound of Jordan Martinook’s shot from the left circle. Crawford chopped his stick on the crossbar and broke it after de Haan scored from just outside the crease 1:20 into the second to extend Carolina’s lead to 4-0. DeHaan, a defenseman, was left open after he pinched in and took a nifty feed from Sebastian Aho from behind the net. 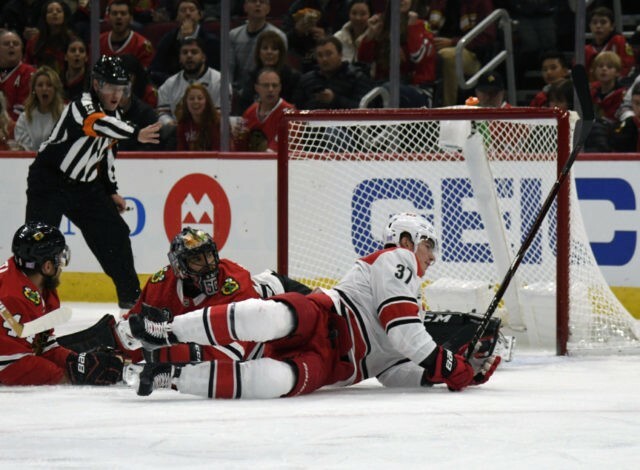 NOTES: Blackhawks C Marcus Kruger suffered a left leg injury in the second period and didn’t return. . Petr Mrazek, the Hurricanes No. 1 goalie so far this season, missed his third game with a lower-body injury. … Saad played with a plastic full-face shield after taking a puck in the mouth in practice on Wednesday, then undergoing dental work and getting about 15 stiches. . Di Giuseppe had been recalled from Charlotte of the AHL on Wednesday and played in his third game this season. . Blackhawks F Chris Kunitz, D Duncan Keith and G’s Crawford and Cam Ward are older than Colliton. D Brent Seabrook, also 33, is just three months younger. . Quenneville had another year left on a three-year contract extension he signed in 2016 that pays him $6 million per year, second-highest in the NHL behind Mike Babcock in Toronto.